What would an academic degree look like if it was designed today? Or a professional certificate? 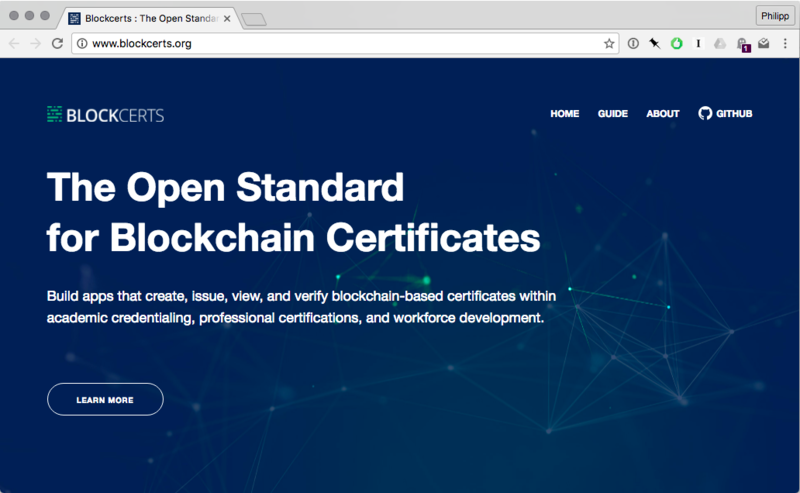 These are questions we have been working on over the last year, and we are excited to announce the release of Blockchain Certificates (Blockcerts) — an open standard for digital academic certificates on the Bitcoin blockchain. Issuer — Universities create digital academic certificates that can contain a wide range of assertions about an individual’s skills, achievements, or characteristics, and register it on the bitcoin blockchain. Certificate — Certificates are open badges compliant, which is important, because there is an entire community of open badges issuers that we want to support, and because open badges is becoming an IMS standard. Verifier — Anyone can, without having to rely on the issuer, verify that (1) a certificate has not been tampered with, that (2) it was issued by a particular institution, and (3) issued to a specific user. Wallet — Individuals can safely store their certificates, and share them with others, for example, an employer. The iOS wallet is available already, and we are looking for partners to develop an Android version. On the project homepage at http://blockcerts.org you can find reference implementations for the software components, extensive documentation, and information on how to join the developer community. All of our code is released under the MIT open source license, which means anyone can use it, share it, and develop applications on top of it. If you are interested in our general thinking on the topic of credentials and blockchains, please also read our longer posts (here, and here). Many of the points we made continue to be relevant to our work. At its core, Blockcerts is open. The software is open source and anyone is welcome to join the developer community. Only an open standard allows individuals to remain fully in control of their own academic history. That is important, because academic certificates are markers of our lives. They can be tickets to a better job or education, and we can use them to tell a story about who we are and how we have become that person. And being open enables us to bootstrap a new ecosystem for digital academic credentials, by allowing other collaborators to take co-ownership. Through collaborating around an open standard, we can help to insure an interoperable credentialing ecosystem. The Bitcoin blockchain is still a relatively new technology and its complexity and immutability make it important to carefully consider the long-term effects that small design decisions can have. Letting others review and contribute will make Blockcerts more robust and reliable. 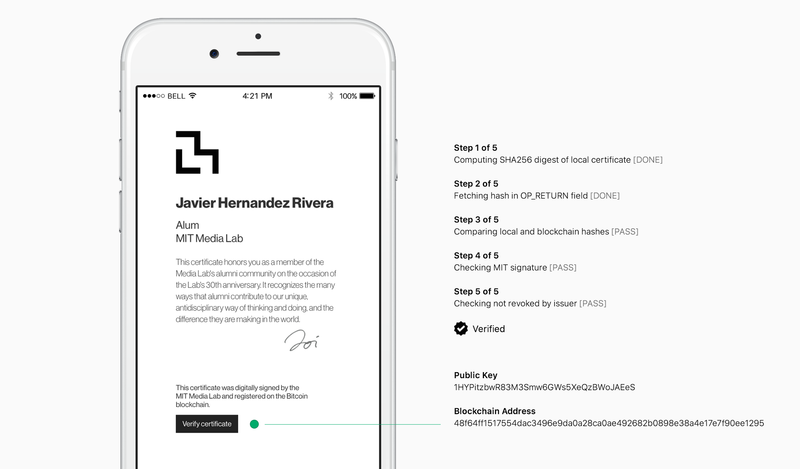 We are hoping to establish Blockcerts as the open standard for issuing, sharing, and verifying digital academic credentials. To this end, we are looking for organizations to deploy the code, to build applications on top of it, and to join our developer community. Developers can start participating in the github repository or request an invitation to the slack community to ask (and answer) questions and share best practices. Universities, colleges, and workforce training providers can start issuing digital and verifiable credentials to their students. Blockcerts can be used to issue any kind of digital credentials, including professional certificates, transcripts, credits, or degrees. Employers can start verifying incoming certificates. They can use the reference implementation to create their own verification services in-house (or wait for trusted third-party verifiers to emerge). And they can start requesting Blockcerts compliant certificates from universities to streamline the hiring processes. Education technology companies can start developing applications on top of the Blockcerts standard. Two areas where we expect to see a lot of innovation are verification services that connect into existing legacy systems, and issuer identity services that link blockchain addresses to institutions. For universities interested in blockchain research, there is an additional benefit. Our code is ready to deploy and well-documented, and provides a good way to get started with Bitcoin blockchain application development. More information can be found on the http://blockcerts.org home page. Blockcerts started as a research project at the MIT Media Lab, led by Philipp Schmidt and Juliana Nazare (with help from many others, including Guy Zyskind and Jeremy Rubin), and we were fortunate to find a group of terrific collaborators in Learning Machine, an education technology company with an office in Cambridge, MA. Kim Hamilton has been the technology lead and release manager for the core software and standard, and Chris Downie developed the iOS wallet reference implementation. Chris Jagers and Dan Hughes, have been instrumental in thinking through the broader implications of an open standard for academic certification.